You don’t have to turn on the stove or the oven to make this refreshing dessert: fruit soup. Made from fresh or dried fruit, served hot or cold, fruit soups are underrepresented on American menus. Yet, they offer variety year-round. Cold soups tend to be made with seasonal fruit and are thus served in warmer weather. Soups made of dried fruits, such as Norwegian fruktsuppe (made of raisins and prunes), can be served hot or cold in any season. Fruit soups can be cream soups or purées with or without the addition of fruit juice, and can include alcohol such as brandy, champagne, Port or wine. Sweet fruit soups can include meat; and in at least one instance, a fruit soup can be completely savory, like Chinese winter melon soup. While fruit soup can be served for dessert, it also can be a first course or an intermezzo between fish and meat courses. Fruit soup in a footed bowl. Photo courtesy Driscoll’s. 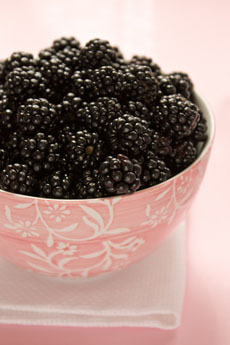 Here’s a no cook light summer dessert dessert recipe from berry king Driscoll’s. Made primarily of blackberries, it adds red wine for a sophisticated layer of flavors (some red wines are often described to have hints of blackberry flavor). Prep time is 5 minutes. Serve with a piece of shortbread on the side. 1. 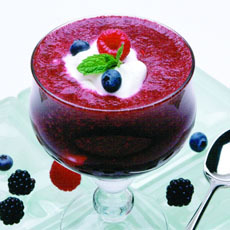 PURÉE blackberries, wine and sugar in blender or food processor until smooth. Press through a strainer to remove the seeds. Discard solids. 2. STIR in lemon juice; season lightly with salt and pepper. Cover and chill several hours or overnight. 3. LADLE soup into chilled bowls, footed glasses or wine goblets. Drizzle or spoon sour cream on top, and scatter with raspberries and blueberries. 4. GARNISH each serving with a mint sprig or coarsely chopped mint.